Cherry Blossom. Oil on panel, 8" x 8". $175. Click to buy. Several years ago, I moved into my first studio outside of our house. It was in the basement of an old building that housed several retail and creative businesses. When I went to look at the studio, I met the soon-to-be-former tenant, a woman who made bags and children's clothes out of cool printed fabrics. She sold her creations on Etsy, but her business had grown to include yardage sales, and she had outgrown the studio. She was about to open a fabric shop in a real retail spot, called Buttercuppity after her Etsy business (seriously, how awesome is that name?). The fabric in the background of this painting came from her shop, now sadly closed due to a health problem. Hopefully she is better now. I miss her shop and her blog. Ari Rooney, if you happen to see this, cheers to you! Peach Pegu 2 and more! Peach Pegu 2. Oil on panel, 6" x 6". $125. Click to buy. I have the first recipe for my next book! Mixology: the Art of Classic Cocktails is all about old recipes. The new book, "Mixology with a Twist: the Art of Modern Cocktails," will be collection of new recipes invented by Northwest bartenders. With paintings, of course. Well Equipped. Oil on panel, 8" x 8". $175. Click to buy. 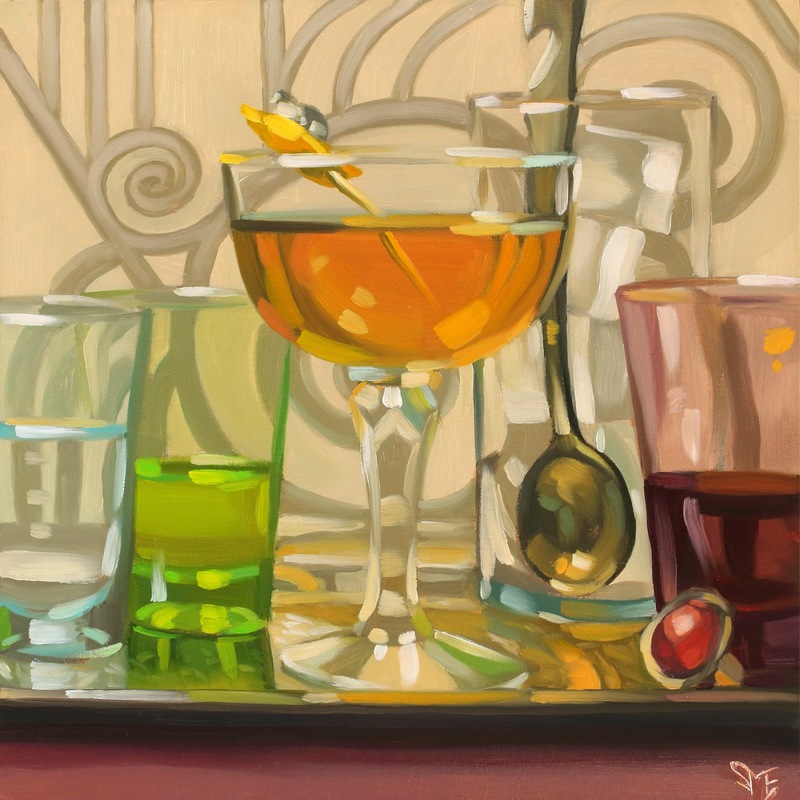 This is another painting from my book, from a list of bar necessities. It's one of my favorites and it is now available on Daily Paintworks! When I started setting up this still life, I knew it needed some sort of juicer, but I didn't have one. I had everything else in place, and was liking the green handles of the tools in the glass. Soon it was obvious that a green depression glass reamer would tie everything together, but it had to be small to fit in the setup. Of course I found exactly what I needed that very morning at United Hillyard Antique Mall. And a bonus antique Indian shaker besides. 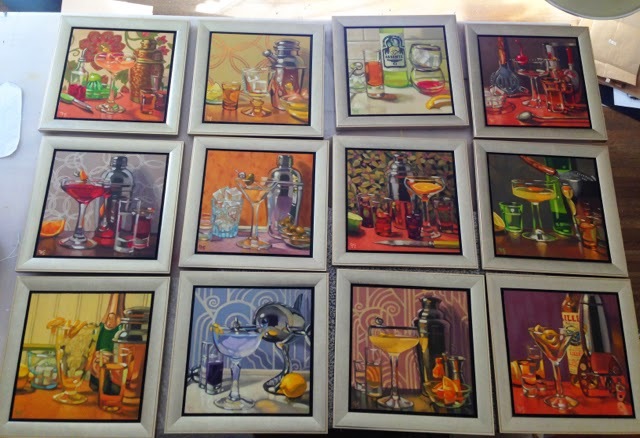 And now for something (almost) completely different… just in time for the holidays, I have giclée reproductions of some of the most popular Mixology paintings available on Etsy. More about that here. Back to the easel, and onward. Original oil on panel, 5" x 5". Sold. Berry Infusion is one of a handful of little 5" x 5" pieces I made for Yuletide, and one of only two still looking for a home. I love the combination of the pale pink cocktail with the berry-patterned wallpaper and silver-and-bronze shaker. I didn't intend it to be a particular drink, but it could be a Cosmopolitan or Pink Lady, among others. Purple Skies. Oil on panel, 8" x 8". Sold. Last weekend was Yuletide, and what a great show! 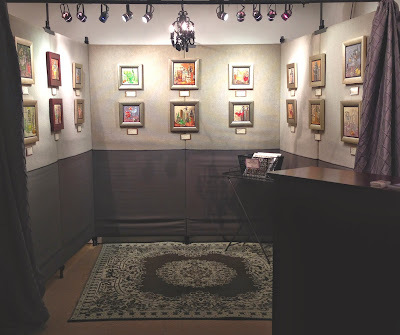 So many original paintings, giclées and books found new homes. I'm so grateful to everyone who came and supported me and the other amazing artists. But many paintings are still looking for their forever homes, and I've been promising for a while that small original works would be available online. So starting with Purple Skies, above, a new painting will appear each day here and on Daily Paintworks. All of the paintings are done in oil on masonite panels, and are ready to frame. Please be aware that the color may vary from monitor to monitor. For instance, Purple Skies looks over saturated on this blog (on my monitor)---the background is really a muted periwinkle blue. Yuletide starts today! Here's my "speakeasy" booth, complete with chandelier, all set up and ready to go in Gallery C at the MAC (Northwest Museum of Arts and Culture). 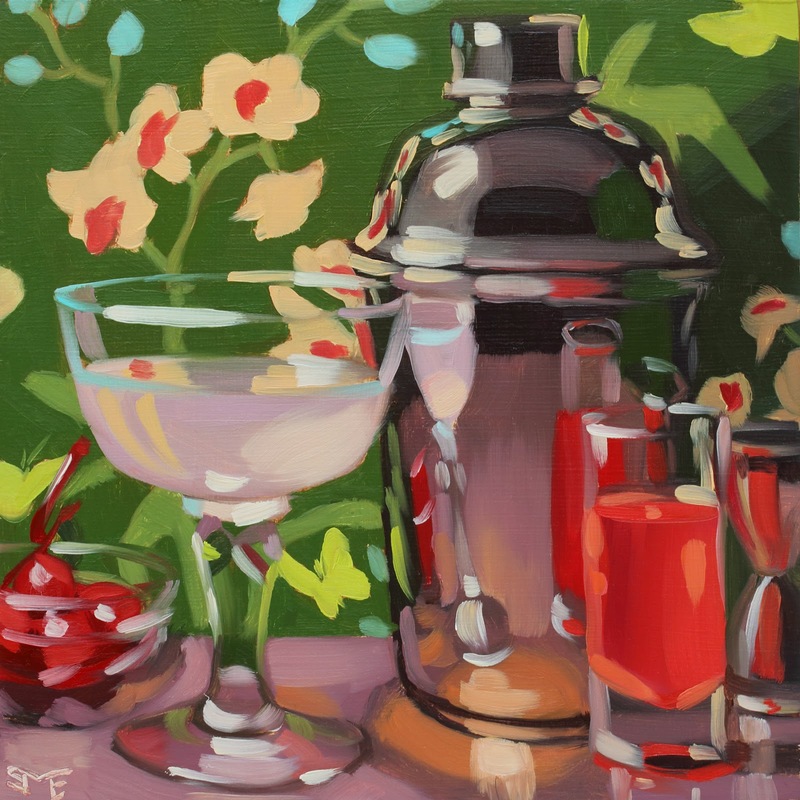 I have lots of original paintings (framed and unframed, from $50 to $250), as well as giclée reproductions and Mixology books. 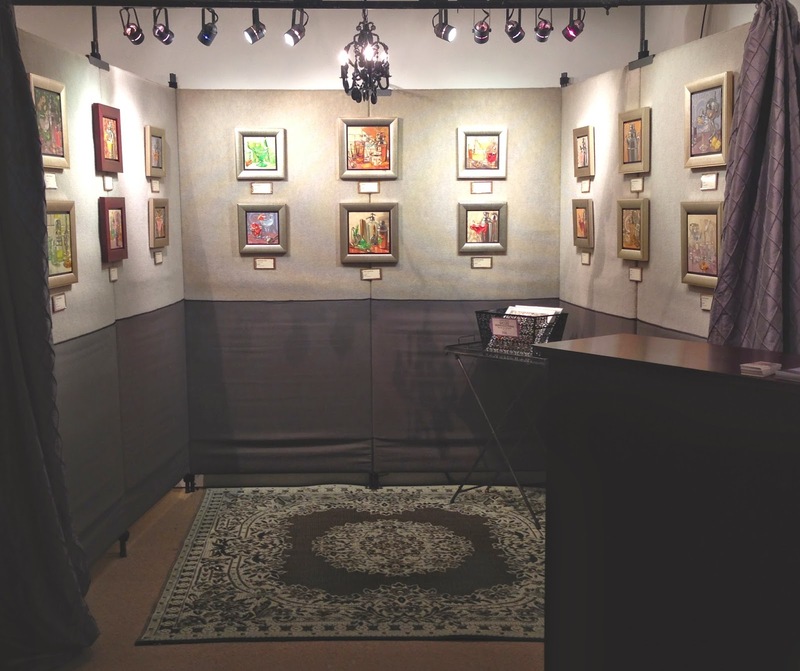 The show looks great, with a diverse and talented bunch of local artists offering unique, gift-friendly creations. Please join us! Bijou. Oil on panel, 12" x 12". $595. Click to buy. It's another busy week, with so much news! First of all, thanks to everyone who came to the Mixology book release, and bought books, paintings and giclées. I was happily overwhelmed by the response. 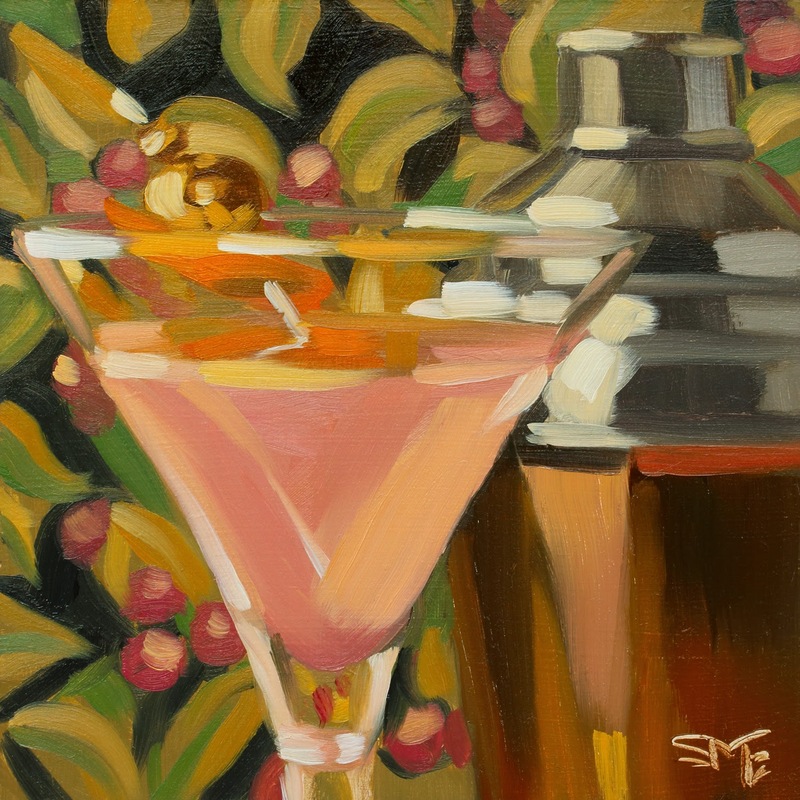 Daily Paintworks: Original paintings from the Mixology book that didn't sell on the show's opening night are now listed for sale on Daily Paintworks, along with earlier small works from the series. After Yuletide I will begin posting a new small painting to DP daily. Mixology Books: Copies of the book are now available at Atticus and coming soon to Raising the Bar, both in Spokane. Also, I will have copies with me during my shifts at Iron Goat Brewing, and of course at Yuletide. Not in Spokane? You can order copies directly from the publisher. Mizuna: the Mixology show will remain up at Mizuna through the month. There's still plenty of time to see the original paintings all together, get a delicious lunch or dinner (check out the full vegetarian menu! ), and try a fantastic cocktail or two from this lovely restaurant. They can even make you a drink from my book if you ask nicely. 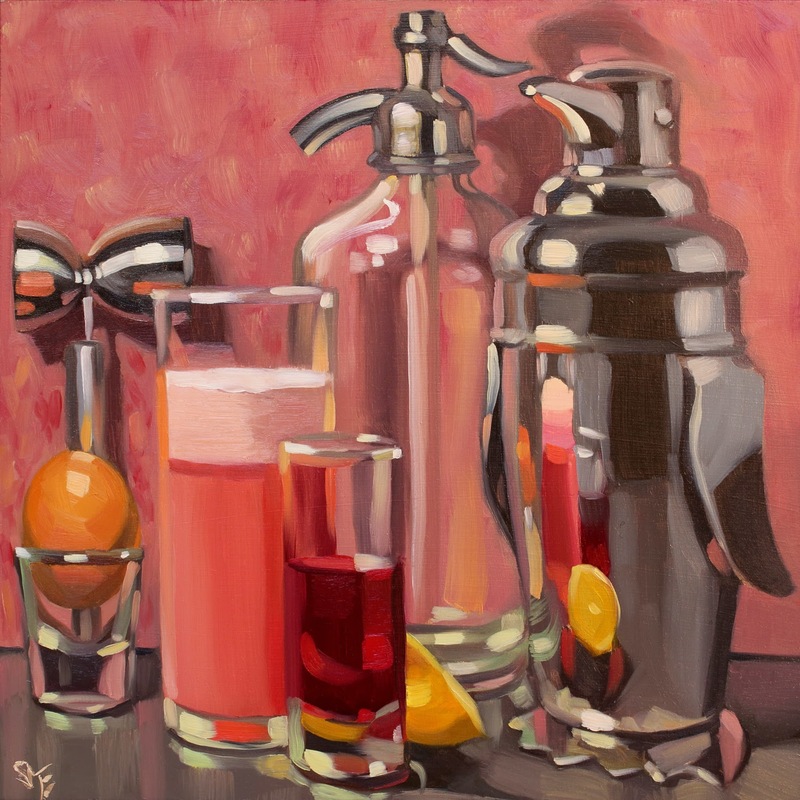 The Art Spirit Gallery: This beautiful Coeur d'Alene, Idaho gallery will feature works from the Mixology series in their December small works show, along with the work of many celebrated Northwest artists. So much exciting stuff going on! I realized this morning that my Bijou re-do got lost in the midst of it, and had never been posted here. It will be at Mizuna through November, and is available for purchase at the link above or by contacting me directly (see contact form at right). Tonight is the night! 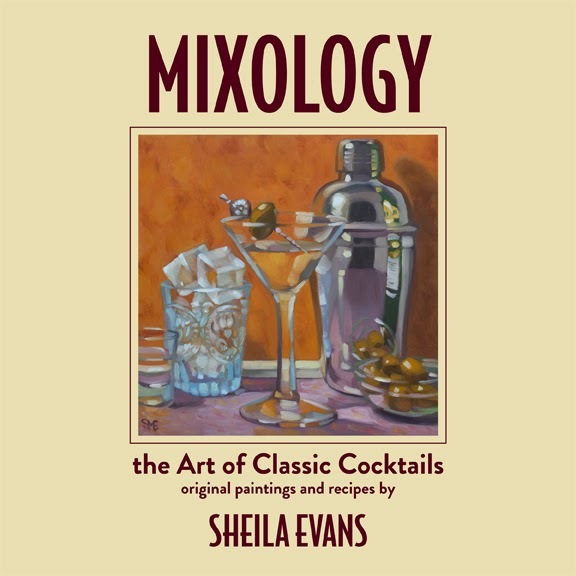 Mixology (the book) makes its debut among all its original paintings at Mizuna in downtown Spokane. Besides the original artwork and books, there will be repros of a few of the paintings, great cocktails and delicious food by Mizuna, and "Vintage and Badass Barware" by Raising the Bar out front. The Spokesman-Review did a great piece on the book and show today. And in case you missed it, here's a link to last week's article in the Inlander. If you're in Spokane and out for First Friday, stop by for a drink! 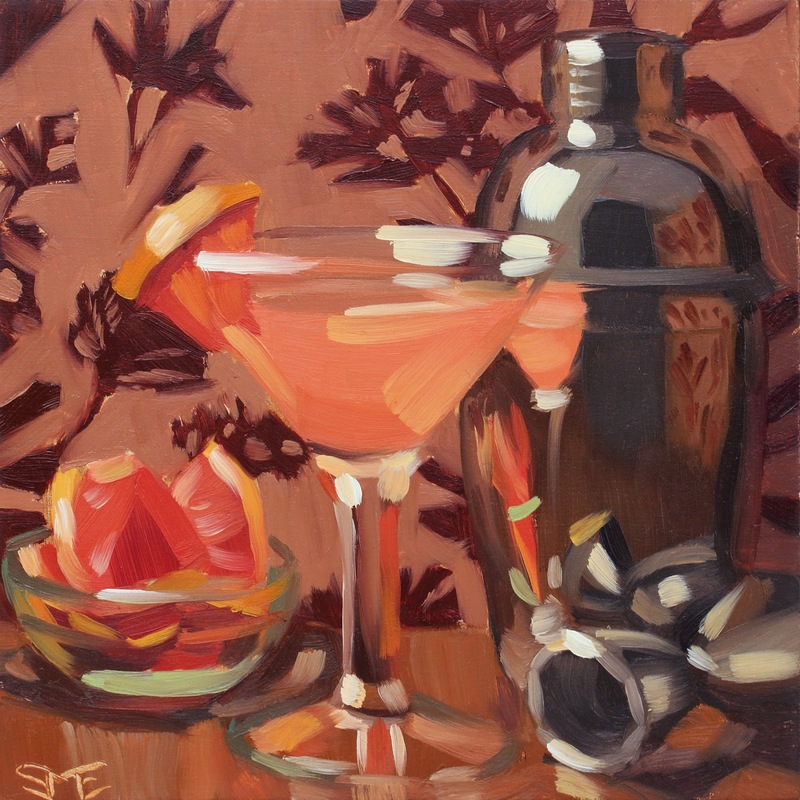 If you aren't, you can still get a copy of Mixology http://mixologyart.blogspot.com/p/get-book.html. Ruby Fizz, and Book Release! Ruby Fizz. Oil on panel, 12" x 12". Sold. Jinkies! The book release party is day after tomorrow! Everything is ready to go, except hanging the show itself. Paintings are varnished and framed, postcards and emails sent, and books are here waiting for their new homes. Since the release is only two days away, I've gone ahead and made books available for online ordering now. 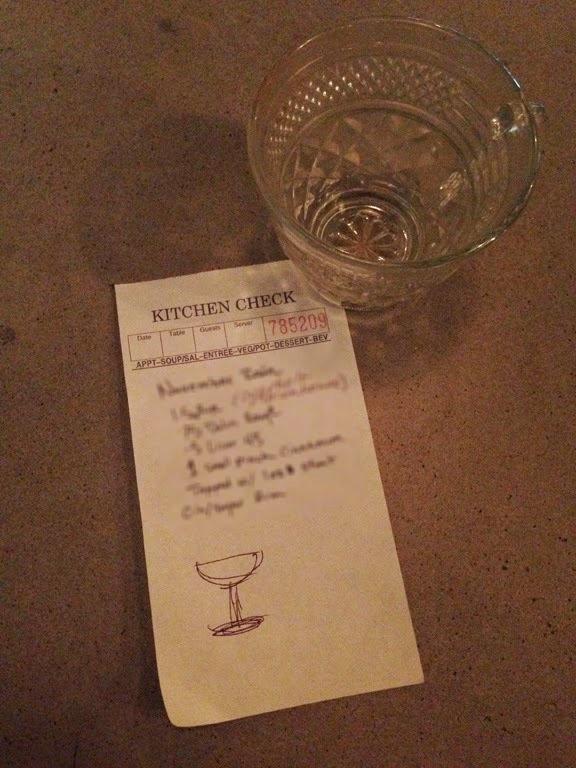 Print copies can be delivered in as few as five days, and there is even a wee mobile version to turn your phone into a classic cocktail recipe book! I forgot to post this painting when I made it. Ruby Fizz was a really interesting drink, with a cotton-candy texture, and the rich, dried-berry flavor of sloe gin. The most fun part of the painting was the shaker, which mysteriously appeared in the brewery office one day along with another shaker in the shape of a polar bear. It turns out the shakers belong to a couple of friends (and animal lovers) who are regulars at at the taproom. 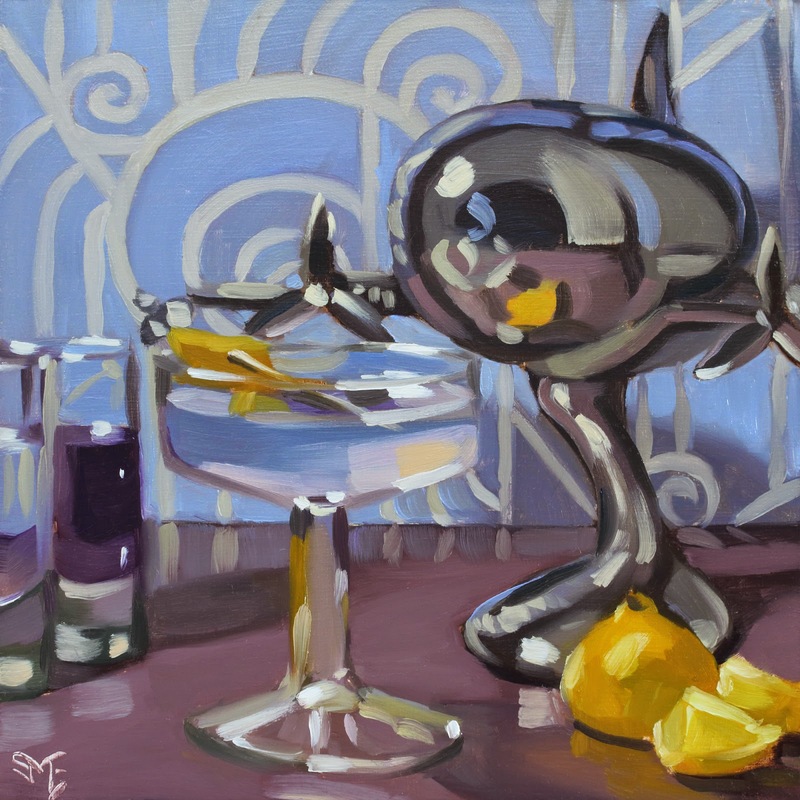 Since the penguin is a spin on vintage shaker designs, and it arrived just before my last planned painting, I was happy to feature it in the vintage drink book. The polar bear is a totally modern design, though, so it will have to wait for the next book. I hope Fred and Royln can stand to be without their silver pets for a while longer!